Doesn’t this dress just make you want to party? The shocking lime green color + fun placement of ruffles made this dress irresistible to me. When wearing things this vivid, I sometimes like to get a little playful with accessories. This chartreuse dress pairs perfectly with my turquoise earrings, don’t you think? I’d say it proves two brights make a right. This simple shift is no plain jane. In the juiciest shade of orange, you’ll catch the eye of everyone at the party! Love the ruched bodice and flattering fit of this mint midi dress! Take a page out of Isabel Marant’s book in this effortless lace-inset dress. This hot pink popover is such a fun idea for a night on the town this summer! that dress is so cute, love the color. The color of this dress is too fun! Love those earrings and I agree – 2 brights make a right indeed! I love the lines of this dress! I love the lighthearted, fun loving vibe and that lime hue looks fabulous with your coloring. Hope you had a wonderful weekend, Merritt! 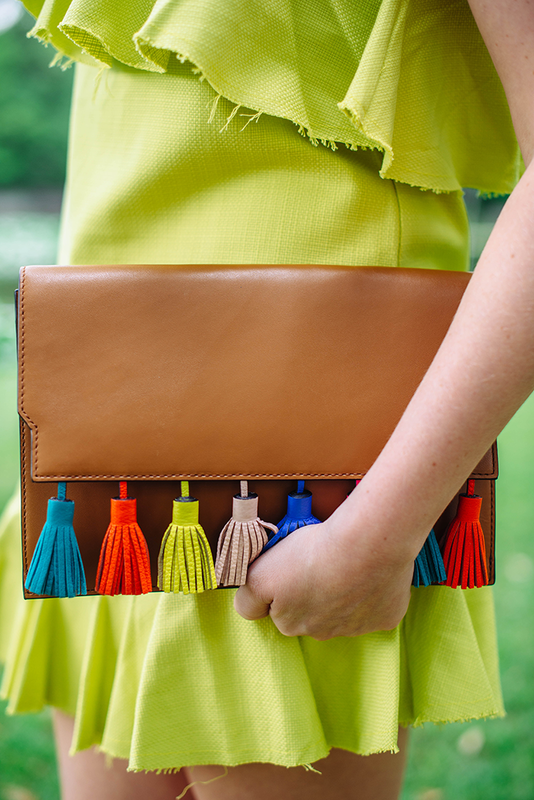 Love the bold color, and I have that bag too… so fun that the tassels go with so much! Great spring inspiration — perfect for a casual wedding. This dress is so fun!! I love the color and the ruffles. Love that you added some pops of color with it! Just ordered a similar version of that tassel bag, and I’m dying to get it!! These photos are absolutely stunning and such a fun outfit! I’m usually not drawn to a lot of color, but this look is just too perfect for the warmer months. Love it! I agree, the ruffles and color are so fun! I love the raw hem too and how well it pairs with your cute bag. SO cute!! Love the raw edges- gives the dress a little less formal! Perfect look! It is a really fun dress. I love the earrings and the tassels on the bag. Cute as all! You always find the BEST ASOS dresses… this one is so fun and the price is too good to be true! SO pretty! Love that dress – such a fun color! And that bag is the perfect statement accessory! super cute dress! Loving the material – so spring and fun. perfect!! Loving that hue on you, lady! Gorgeous color on you! This would be perfect for a cinco de mayo party!